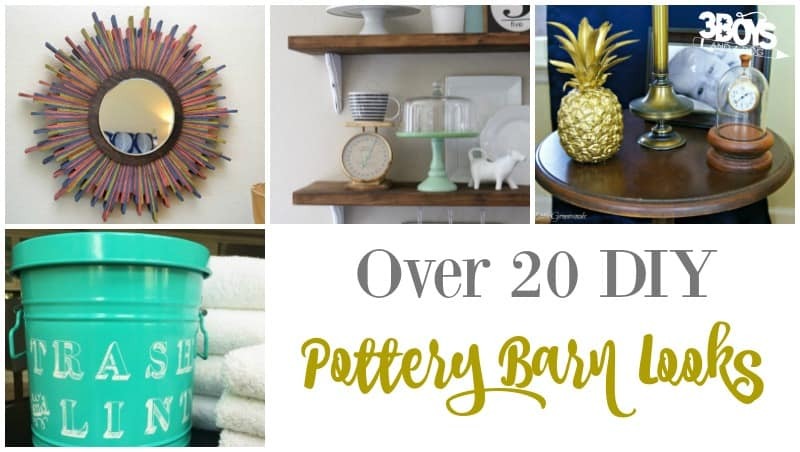 Pottery Barn makes some of the loveliest home decor items around. But – let’s face it – I simply can’t afford to shop there too often! I’ve got a large family and we’re living on a budget that just doesn’t allow it. But that doesn’t mean that I can’t make Miller Manor into a Pottery Barn-worthy spread! Thanks to the Internet, there are plenty of ways to add the same kind of decor to the home without having to spend all that money. 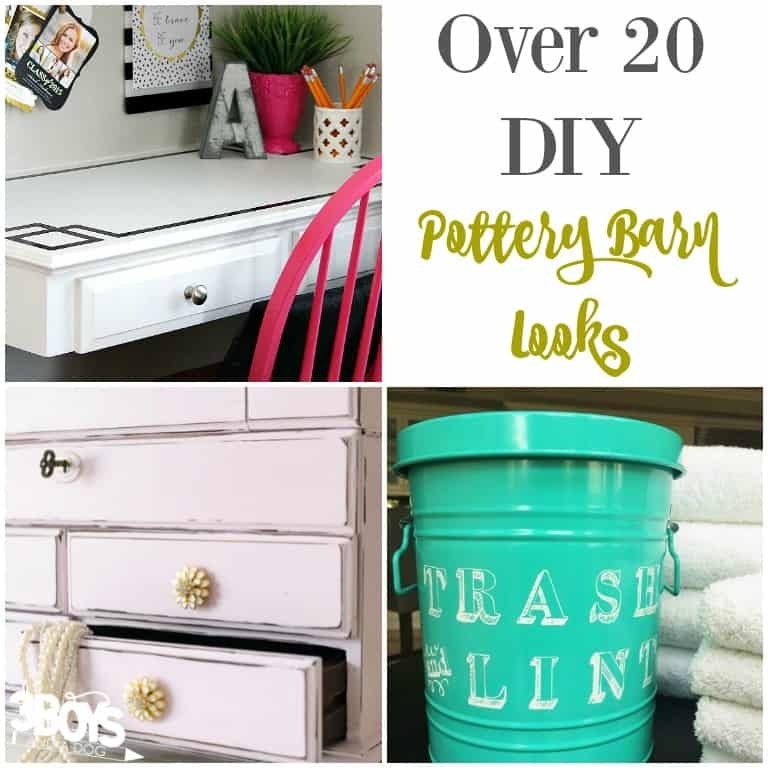 If you’re ready to add a little “oomph” to your space, check out this roundup of over 20 DIY Pottery Barn looks. There are ideas here for wall decor, furniture redos, and more! For more ways to make over your home, don’t miss these wall decor art items for kids or these silver home decor accent pieces! 1. These Dip Dyed Wooden Candlesticks would make a perfect accent to a family room! 2. Tired of standard shelving? Make these Farmhouse Chic Dining Room Shelves and hang them yourself! 3. This Barnwood Fall Sign would be a lovely way to decorate your front porch for fall! 4. Give your kitchen a brand new look with these Faux Chalkboard Cabinets! 5. This Wood Shim Starburst Mirror is seriously gorgeous. It would look amazing over a fireplace! 6. 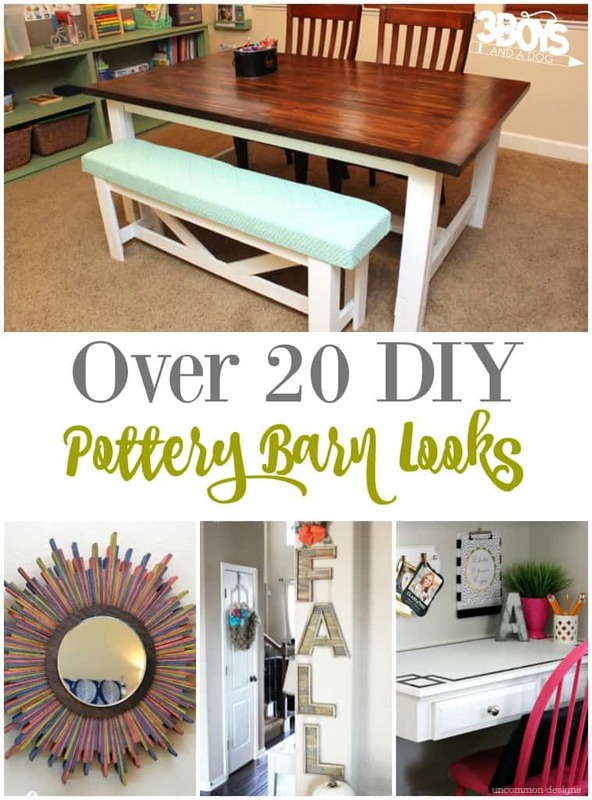 You can actually make this DIY Farmhouse Table with Bench yourself. Talk about a room redo! 7. Give an old desk new life with this DIY Dollar Greek Key Desk Upgrade! 8. Toss your old lampshade and make this Upcycled Wire Lamp Shade! 9. This cute DIY Brass Pineapple would make a great gift! 10. Serve brunch or tea on this DIY Rustic Wooden Tray! 11. Turn an old dresser into this fabulous Upcycled Dining Room Buffet! 12. This Mason Jar Soap Dispenser would be a nice touch for a guest bathroom! 13. Found an old chair on the side of the road? Make it over with these instructions for a Simple Recovered Chair! 14. If you love the antique look, this Chippy Glam Dresser Makeover is for you! 15. Make this DIY Leather Footstool and set it in front of the sofa or your favorite armchair! 16. Refinish an old table into this lovely Upcycled Antique Table! 17. Need a new place to store your baubles? Try this DIY Jewelry Box Makeover! 18. Make this DIY Stenciled Metal Laundry Trash Can and give your garbage can a laundry room look! 19. Use plain old wood crates to make this DIY Wood Crate Bookshelf! 20. These DIY No Sew Rope Baskets would be nice clothes hampers for the kids! 21. Add beautiful decor to your walls with this DIY Batik Dye Wall Hanging! These affiliate resources from Amazon make it simple to give your home a Pottery Barn style makeover! Great! I will try them 1 by 1 from now. Thanks!